Just a note – On Tuesday, June 11, I’ll be joining John Mauldin, Kyle Bass, Mohamed El-Erian, Barry Rithholz and David Rosenberg in a free online video event at 2PM Eastern – Investing in the New Normal (click the link to register). The panel is moderated by Ed D’Agostino of Mauldin Economics. It will be a wide-ranging conversation on markets, economics and investing. Aside from the company of great thinkers (no other compensation necessary), I had the added fortune of meeting Art Cashin, who joined several of us for dinner last Wednesday and regaled us with the stories of a true Wall Street veteran, all in the glow of his kind, warm personality. Let’s begin with a reminder of where we are in the market cycle. At present, the stock market is in a mature, heavily bullish, overbought, overvalued bull market advance, near a multi-year high in the S&P 500, with consumer confidence at similar multi-year highs, with the broad perception that downside risk is insignificant, and that “tail risk” has been eliminated. This is a dangerous place to be, because it is precisely where risk aversion is scarce and hated most by investors, and where risk aversion is most likely to be rewarded in the future. Consider the opposite. Recall the points in time where the stock market has been in a mature, heavily bearish, oversold, undervalued (or at least moderately valued) bear market decline, near a multi-year low in the S&P 500, with consumer confidence at similar multi-year lows, with the broad perception that downside risk is enormous, and that “tail risk” is growing. This is a wonderful place to be, because it is precisely where the willingness to accept risk is scarce and hated most by investors, and where the willingness to accept risk is most likely to be rewarded in the future. Which market environment is the one where investors should generally be optimistic about multi-year market prospects? Clearly, the second. It’s a description that applies well to the 1974, 1982, 2002 and 2009 bear market lows. In contrast, the present description applies equally well to the 1972, 1987, 2000 and 2007 bull market peaks. It should be utterly obvious here that risk aversion is appropriate in present conditions. I’ve created some noise in the signal that investors are getting here. That’s because despite obvious historical evidence that we are in very dangerous conditions, it seems quite easy to dismiss these concerns. Why? Two reasons: 1) I insisted on stress-testing against Depression-era data in 2009-early 2010, and missed significant gains in the interim; 2) I missed the opportunity to be more bullish at several points since 2010 where speculation would have been possible (as more recent research suggests that we can “override” negative return/risk estimates even in overvalued markets, provided that trend-following measures are favorable and hostile “overvalued, overbought, overbullish” syndromes are absent). I frequently discuss our 2009-early 2010 miss, not because I enjoy doing so, but because it remains a source of misunderstanding. If one doesn’t correctly understand why I was defensive then, it's tempting to argue that there's no reason to be defensive now either. At the beginning of the 2003 bull market, I shifted decisively to a constructive view, yet I remained defensive in 2009, despite better valuations. The best way to understand this narrative, and to see why we expect to be appropriately constructive in future cycles, is to understand why we missed that opportunity in the present one. See, that 2009 miss wasn’t because our estimates of 10-year prospective market returns were unfavorable. In fact (and as I noted at the time), our total return estimates for the S&P 500 exceeded 10% annually. It didn’t occur because oversold measures or sentiment measures were somehow not working. Indeed, that miss did not result from the failure of any indicator that has been reliable in post-war data. It was instead the result of a fiduciary decision – terribly timed, but necessary – to ensure that our approach was robust to Depression-era outcomes. I greatly wish that I had viewed Depression-era data as relevant in 2007, when I was already expecting credit strains. But like most historically-minded researchers, I viewed Depression-era data as an outlier. By early 2009, it was clear that we were observing outcomes that had never occurred in the post-war dataset on which our methods were based, which then forced our hand. Remember - the stock market lost 85% in the Depression. What’s a market that’s down 85%? It’s a market that was previously down 70%, and then gets cut in half. So I stress-tested our methods against Depression-era data. Our existing methods performed quite well over the full course of that period, but also allowed several severe interim losses. During the Depression, the market declined by two-thirds even after it became undervalued on every measure. It was that possibility that prompted me to hit the stop button to ensure that our methods were fully robust to those risks; that we could partition favorable and unfavorable outcomes even under the most hostile conditions; and that the resulting return/risk measures could be validated in “holdout data.” In the process, I damaged my reputation for a while, missing a huge advance in the interim. That’s unfortunate, but it’s also fine – markets move in cycles, and this one will also. It’s easy in hindsight to argue that I should not have been concerned about Depression-era outcomes in 2009. But everything is easy in hindsight, once you know how things worked out. My error wasn’t stress-testing our approach. My error was in failing to foresee in 2007 and early-2008 that Depression-era concerns would become relevant. I expected a “writeoff recession” that would have left the real economy largely unaffected. I couldn’t believe that policy makers would choose to violate the Federal Reserve Act (particularly Section 13, which has now been rewritten to ensure it never happens again). I couldn’t believe that they would do everything possible to avoid restructuring bad debt, protecting bank bondholders while trapping millions of homeowners in underwater mortgages, changing accounting rules to obscure balance sheet transparency, imposing financial repression to recapitalize banks at the expense of savers and the elderly on fixed incomes, and creating a long-term structural unemployment problem due to an economic house-of-cards that offers perpetual fiscal, monetary and regulatory uncertainty. The bad policy choices were inconceivable. They still are. Main Street still struggles with unemployment and collapsing labor force participation, but Wall Street banks are as happy as clams. In any event, I have no question that our discipline will be better in the future because of those stress tests and the methods that resulted. What’s striking to me is that investors, broadly speaking, have really done no work to recognize or analyze the errors that they made in 2000 and 2007, not to mention at other bull market extremes. The primary and repeated error, simply put, has been the disregard for the combination of overvaluation, overbought conditions, overbullishness, and early deterioration of interest-sensitive sectors. That syndrome of overvalued, overbought, overbullish, rising-yield conditions has been anathema to investors again and again throughout history. The various ways to define this syndrome are nearly unlimited, but are uniformly hostile. When in history has consumer confidence been at a 5-year high, with fewer than 30% bears among investment advisors, a Shiller P/E* greater than 18 (it’s presently 24), and the Dow Utility average down more than 5% from its 6-month high? 2013 (today), mid-2007, early 2000 and Aug-Sep 1987. Nobody cares. That indifference is probably unwise. My opinion? I expect that by the end of the next bear market, the S&P 500 will have surrendered the entire total return that it has achieved, in excess of Treasury bill returns, since about 1997. That’s assuming the next decline is simply run-of-the-mill for a cyclical bear in a secular bear. Put differently, I expect that stocks will have lagged Treasury bills from 1997 forward. This isn't as striking a view as it might seem, as the 2000-2002 decline wiped out all of the market's excess return back to May 1996, and the 2007-2009 decline wiped out all of the market's excess return back to June 1995. Put simply - it's likely to be awfully difficult for the market to retain its recent gains over time, and given present valuations, a defensive stance will be far more forgiving of any missed bull market gains than investors imagine. The argument is not that stocks will or must crater immediately. The argument is really two-fold. First, our estimates of expected market return/risk remain negative on a blended horizon of 2-weeks to about 18-months, while the presence of overvalued, overbought, overbullish conditions prevents trend-following considerations from overriding those negative return/risk estimates here. Following a discipline that aligns our investment stance with the expected return/risk profile, we are defensive. Second, our estimates of 10-year prospective annual total returns for the S&P 500 are hardly above 3% nominal. About 2% of that is expected from dividends, which correctly implies that we expect the S&P 500 Index to be only about 10% higher, 10 years from now, than it is today – and we do not require the assumption that the Index would be undervalued at that point. The good news is that even we expect stocks to outperform Treasury bonds over the coming decade. The bad news is that we don’t expect these returns to be achieved smoothly, and instead expect that the coming decade will probably include two separate market declines on the order of 40-50% each. Even Vanguard’s Jack Bogle has suggested something along the same lines, though his estimate of prospective returns is about 3% higher (I think because he implicitly assumes less margin contraction that we do). Jack advocates a passive investment stance, but one that can tolerate the prospect of repeated 30-50% market losses without abandoning that discipline. I have no argument with investors who choose that approach, are comfortable with existing long-term return prospects, and are committed to following a passive strategy through thick and thin. This is easy. Those who understand my stress-testing decisions, and the basis for my defensiveness here, should have no problem holding to a discipline that omits mature, overvalued, overbought, overbullish, rising-yield market conditions from the list of appropriate times to accept significant market risk. Those who view my own errors during the recent market cycle as an adequate basis to ignore market conditions that have nothing to do with me personally, and that have always ended in tears, can go ahead and roll their dice. I’ll honestly be happy for them if they get out with their pants on. I don’t think they will, and I don’t believe that in aggregate they even can, but nothing compels anybody to act on my concerns. Simply put, I’ll continue to do what I believe is in the best long-term interests of the people who trust me. Nothing in my views should deter investors from following more passive disciplines, or well-tested approaches that fit their own risk tolerance. Investors having no well-tested discipline seem to be investing at the mercy of aphorisms and whims, not to mention the competition of tens of millions of other investors acting on precisely the same aphorisms and whims. I suspect that bad outcomes will be over-represented among these investors. But they too can follow their own stars, and roll their own dice. *The Shiller P/E is the ratio of the S&P 500 to the 10-year average of inflation-adjusted earnings. While I often use the Shiller P/E as a shorthand valuation metric because of its popularity, numerous other valuation measures have an equal or stronger relationship with subsequent market returns. See Investment, Speculation, Valuation and Tinker Bell for several reliable measures and related calculations. 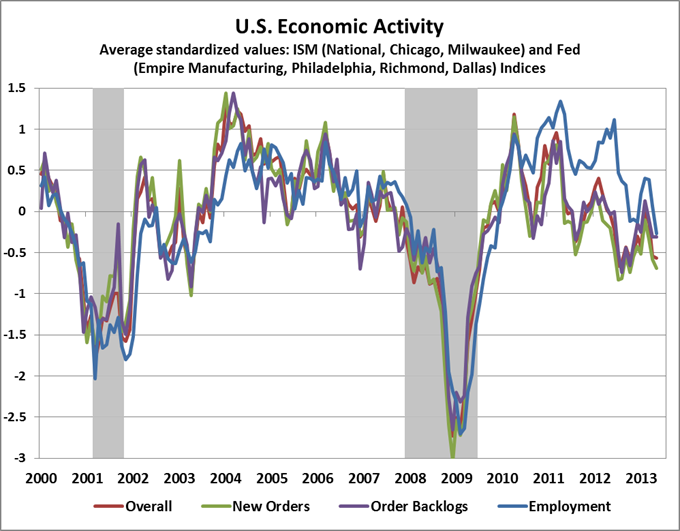 With the latest data from the Institute for Supply Management, we observed a further weakening in national and regional indices of U.S. economic activity. The latest employment data included a positive surprise for May and a negative revision for April, but payroll employment is actually among the most lagging economic indicators available, making it difficult to obtain much forward-looking evidence from that report. It's reasonable to say that economic momentum actually peaked about 8-10 quarters ago. Since then, economic activity has bounced repeatedly near the border that has historically separated expansions from new recessions. Historically, the economy has rolled over into recession quickly after breaching various thresholds of economic activity. In the recent cycle, the economy has “hovered,” which has at least held a recession at bay – if only by a weak margin. The main impact of quantitative easing has been to release short-lived bouts of demand sufficient to prompt bounces on the order of 1-2 quarters, followed by fresh deterioration, and a fresh round of QE. Still, each dip has had a lower trough, and a weaker follow-through. At present, it’s difficult to ignore the contrast between the most aggressive monetary easing in U.S. history, and the tepid economic progress that has followed. “Beneficial effects of the actual and potential monetization of public and private debt, the essence of the QE program, appear limited and diminishing over time. The old ‘pushing on a string’ analogy is relevant. The risks of encouraging speculative distortions and the inflationary potential of the current approach plainly deserve attention. All of this has given rise to debate within the Federal Reserve itself. In that debate, I trust sight is not lost of the merits – economically and politically – of an ultimate return to a more orthodox central banking approach. Overall then, despite massive quantitative easing, the benefits – to use Volcker’s words – “appear limited and diminishing.” Meanwhile, the costs are already significant, particularly in terms of economic distortion. There is little question that the dominant view on Wall Street is that the Fed will sustain QE until there is some “handoff” to the real economy. But there is no ball to hand off, and this is becoming increasingly evident even to the Fed. Though I don’t expect that the Fed will slow the pace of QE at its June meeting, it appears likely that the Fed’s statement will shift toward comments that recognize the diminishing benefits and increasing costs of further Fed action. While we put a great deal of emphasis on syndromes of evidence, those based on high-frequency data like daily highs and lows have always struck me as overly prone to noise. That said, we’ve often observed that the best market advances are uniform, while a rising level of dispersion in market “internals” is often an early-warning of trouble ahead. This is particularly true when that dispersion involves interest-sensitive securities like Treasury bonds, corporate debt, and utilities. As the respected technician Bob Farrell often observed, markets are strongest when they are broad, and weakest when they narrow. 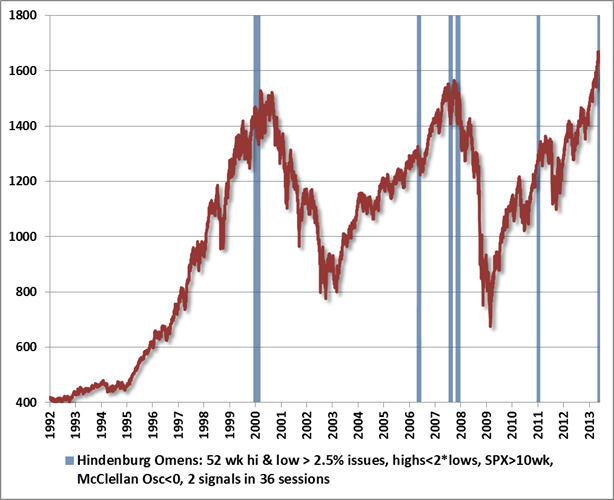 So while we certainly would not put much weight on the so-called “Hindenburg Omen” in the absence of other very negative indications, I suspect that the present sighting will turn out to be one of the spectacular successes, much like the Sep 1987 (not shown), Jan-March 2000, and July-October 2007 instances were. The weakest signal, based on the criteria below, occurred in April 2006, which was followed by a brief correction of 7.6%. The other signal that was not particularly "ominous" occurred in December 2010, after which the market advanced by just over 9% to its April 2011 high, and then corrected nearly 18% over the next 10 weeks. The criteria in the chart below are a slight modification of Peter Eliaides’ definition. There are certainly many more instances where only the first criterion was true, because daily data is noisy. The extra criteria are ways to capture what the syndrome is actually trying to capture: growing internal dispersion of leadership and breadth, within the context of a recently advancing market. Some observers suggest an additional instance in August 2010, but at that point, the market was below its level of 10-weeks earlier, as well as its 10-week moving average, so I disagree with that sighting. In the chart below, the bars indicate points in the past 20 years where the following conditions were true. Two signals within 36 trading sessions, which is helpful for reducing one-off noise. Ominous? Not necessarily. Worth considering in the context of a much more troubling syndrome of overvalued, overbought, overbullish, rising-yield conditions? Sure. As of last week, market conditions continued to reflect a syndrome of overvalued, overbought, overbullish, rising-yield conditions. Strategic Growth remains fully hedged, with a “staggered strike” position that places the Fund’s index put option strikes a few percent below present market levels. We actually got a few opportunities to lower those strikes last week as the market decline took those options “in the money.” I expect that we will be slow to raise them in the event of a further advance, but my clear expectation is that prospective market risks far exceed prospective returns here. Meanwhile, Strategic International remains fully hedged, Strategic Dividend Value remains hedged at about 50% of the value of its stock holdings, and Strategic Total Return continues to carry a duration of about 3.5 years (meaning that a 100 basis point move in interest rates would be expected to impact Fund value by about 3.5% on the basis of bond price fluctuations), with less than 10% of assets in precious metals shares.